A short post this evening but a rather exciting one: I have a new banner! Rosie and me flying over the Highlands. 🙂 Isn’t it gorgeous? Chuffed to bits with it! The original painting (which will be hanging in my living-room very soon) is by Faye Anderson, an artist and friend whose work I’ve adored since she drew a gorgeously intricate birthday card for a mutual friend. 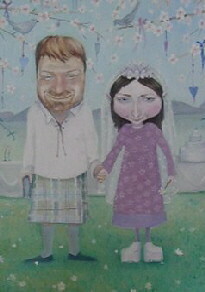 Ten years on I was reminded of how wonderful her work is when I received the following invitation her and Ross’s wedding. Wendy, this is fantastic!!! What a beautiful, beautiful banner. I really don’t know how to say how much I love it. How fabulous to have a portrait like that in your living room. I can’t wait to check out more of her work, and I love her wedding invite too. Oh I agree, simply wonderful!! The banner is beautiful!!! Fantastic! Wendy, it’s marvelous. You and Rosie, flying across Scotland…inspired! How cool is it that Rosie looks like she’s totally blissful, ears flying. Perfect. This is simply marvelous. It cought my eyes the minute I entered your blog. This is one of a kind for sure. A big bravo to your friend. A marvelous Chagall-esque banner. Fabulous! Wow! I love it! It is so you–funny, whimsical, and thoroughly in love with dogs! Amanda – I’ can’t stop looking at it! Her site is still under construction so check back in a few weeks if you want to see more! Maninas – Perfect sense. And I couldn’t agree more! Lucy – I know! It makes me soooo happy just looking at it. Rose – And another bravo from me too! It looks lovely Wendy. And how exciting to have specially comissioned artwork! Too cool Wendy! I think it is you all over and with Rosie… this is too great! And the best thing is you are going to have the painting in your living room! Awwww I love the banner!!!!!! I do love the banner and will definitely check out her site. Thanks for letting us know. This is such a beautiful banner. I will check out your friend’s site. I love her style. Great banner…and I love the wedding invite! How fun! I adore your banner and am so glad to know about this artist! I hope I will be own a piece of her work myself one day. Er, I hope I will own, I meant! I love the new banner, it is absolutely fabulous! What a talented artist! You look very happy, floating by! Very nice Wendy! I’m checking out your friend’s site now! Pille – Thank you! Have always admired your banner. It actually gave me the commission idea! Deb – The original just arrived today. Can’t wait to frame it! Maryanne – Thanks to you too! Cynthia – The site is well worth a visit. She has so many lovely painting on it already. Katiez – They really are fun! Rosa – Hope you are able to do so. Her work is so uplifting. It’s absolutely fabulous. What talent!